Yesterday was a rainy gloomy day so what better thing to do than combine a few of my favorite things and make it a day. I knew I was going to do a Brisket a few days a go so I had already picked one up. 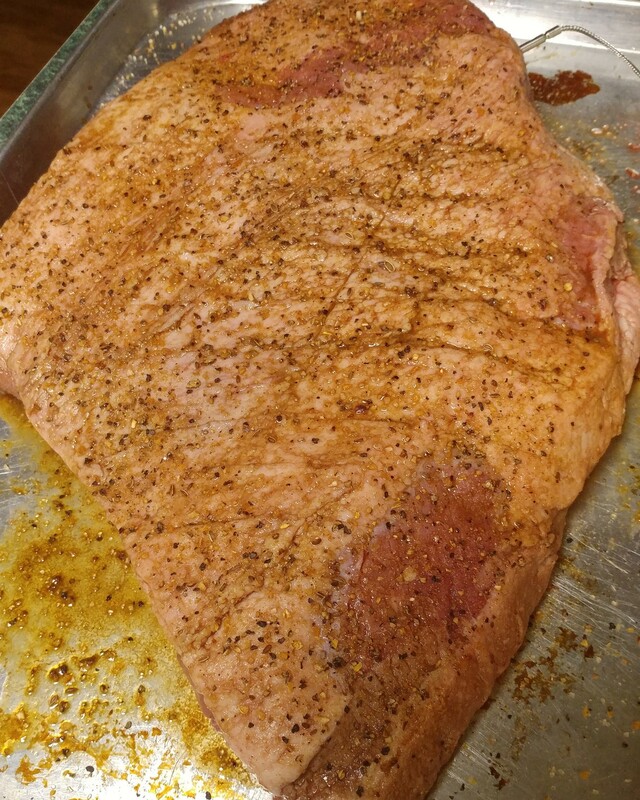 The key to a good Brisket is to start with a tender cut with a nice fat cap. I like to talk to the guy at the meat department and see what they have in back. I can normally find one that bends in the bag pretty easy and almost feels like a bag of soup. Saturday morning at about 6 AM I got the smoker going and I got my temp up to 230 degrees. I threw in some hickory wood chips. While the smoker was getting up to temp, I prepped the meat. I scored the fat cap so the seasoning can get through and I doused the whole thing with some worcestershire sauce and then threw on a pretty basic rub of Salt / Pepper/ Paprika / Garlic Salt / Onion Powder / and a dash of Brown Sugar. I seasoned it and threw it in the smoker around 7:30. I added wood chips every hour and a half for the first half of the process. If you can add wood chips without opening your smoker, that is the way to go. You have to trust what is happening inside of it is what is supposed to happen and never open it until it is done. My goal temp for the Brisket is 195 degrees. It hit that temp at about 4 PM. (This Brisket stalled out at 163 degrees for about 2 hours!) I pulled it off and normally I would wrap it in foil and throw it in some blankets inside a cooler for a hour or so but this time I just left it on the counter for 40 minutes to rest. 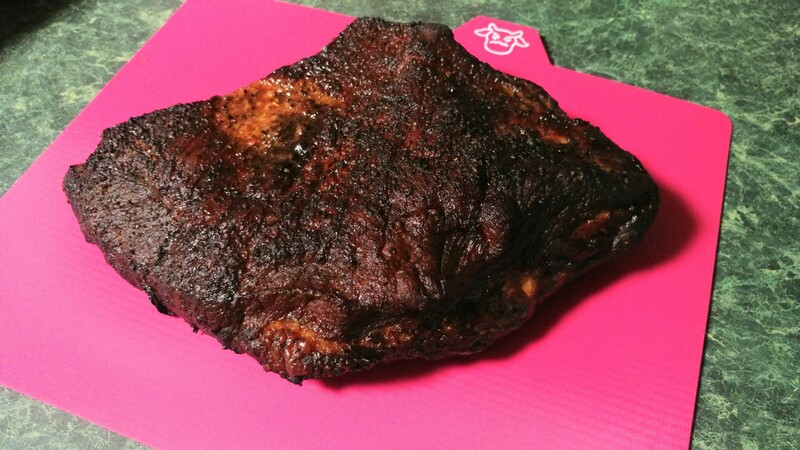 I busted out my trusty Wustof 14″ Brisket Knife and trimmed it into thin – isn slices. Awesome by itself but incredible with a little horseradish sauce! 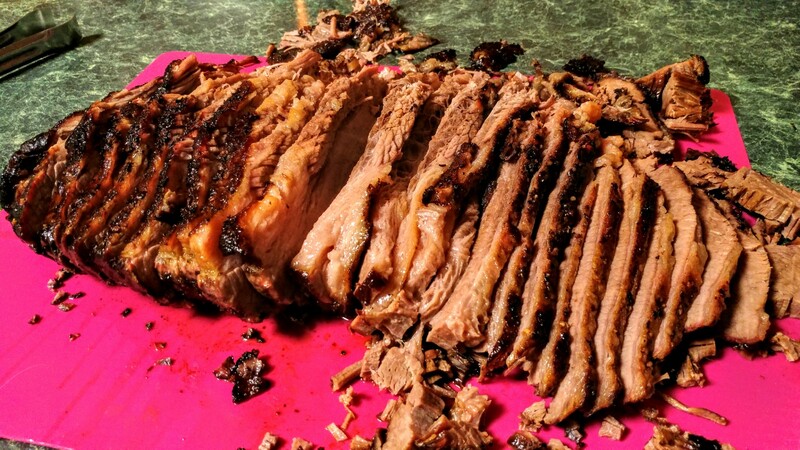 I used to be intimidated by Brisket, but now that I have gotten it down, it seems so easy. This one turned out so good, I can’t wait to go make a leftover sandwich! Good Luck! I am going to show the resident griller (aka the husband) this and the pork loin posts so he can attempt both. He has the patience for all-day grilling. Not me. This could make a rainy day awesome for sure. I’ve had a smoker on my wishlist for too long. Must. Get. I love getting up early and preparing food! I don’t know what i would do without my Smoker! I love it.